What exactly is an industrial climber?! Technically it's called a rope access technician. Except that 'rope access technician' makes sense that to hardly anyone. It's also referred to as industrial climbing, industrial abseiling and high rope access. I’ve embarked on a total career change which required wrapping up seven years of work into one paragraph on my CV. 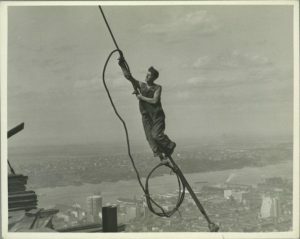 This blog is my chance to explain the rope access world in a bit more depth. That’s me in the blue helmet. I’ve never not smiled for a photograph. Here, we’re replacing old sections of pipe (call ’em spools to sound like a pro) using rigging gear and rattle guns. Rope access involves using a twin set of ropes to suspend a worker in place. The practical rope techniques are based on climbing and caving practices to protect a worker from falling. Some of the highest incidences of injuries and fatalities in a workplace or at home are due to falls from height. We’ve come a long way from these sorts of practices (check this guy out below!). As thrilling as it looks, I definitely wouldn’t do it! A rock climbing mate of mine, Kristi, used to call out at the crux of a climb, "Don’t fall now!". I bet you’d be cruising for a bruising if you said that to this guy. "So...what do you actually do?" 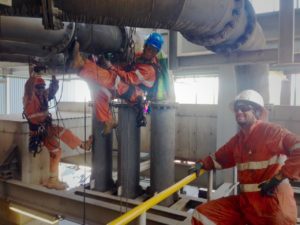 Rope access can involve painting, maintenance, cleaning, construction, inspection and surveying on work sites that include skyscrapers, wind turbines, oil rigs, mine sites, energy plants, domestic construction, sporting and entertainment events. I was fortunate to work in sunny Western Australia, in places that are ruggedly beautiful. The weather there is generally hot, or hot and humid. The work is physically demanding and most ropeys are on the fit side. Maintenance job on the engine of a crusher. Good times at a gold mine somewhere in the desert. One of the most physically demanding yet fun jobs I worked on was on the construction of a gas plant on a desert island, 50km off the coast of Western Australia. For six months I worked the night shift in a team with three hilarious men, on roster of 26 days on and nine days off. The gas plant was built in modules in South Korea and then shipped to Australia. Part of our job involved removing the various-sized pieces of shipping steel that had been put in place to keep the pipework secure during the ocean crossing. I thought it was a bonus that the shipping steel was all coloured bright pink. We set up ropes to climb up and position ourselves underneath a 3m diameter pipe to shift a 100kg steel plate separating the pipe from the concrete structure it was sitting on. The reality of the task meant that we were hanging from a rope next to smooth concrete, with no ability to establish a foothold or gain leverage, swinging a sledge hammer to shift the plate inch by inch. It was a physical slog, but tell you what, it also felt amazing to use a sledge hammer like that, feeling strong and satisfied at the end of a shift. Another benefit is that you get to eat a lot of food, including at least one large block of chocolate every day, if that's your thing. My favourite part of the job was being able to work offshore with a view of the beautiful Indian Ocean, watching whales and whale sharks cruise by. The downside was having to go away to to remote places to earn my keep, with limited contact with friends and family. One big highlight of the job was getting the chance to see wildlife like this beautiful whale shark! The Industrial Rope Access Trade Association (IRATA) is the international body that provides guidelines and regulations for rope access technicians to follow. You can get your Level 1 ticket by taking a one-week course and passing a one-day assessment, after which you’re qualified to set up your own harness and work under supervision. It was a treat to work amongst the Valley of the Giant Trees near Walpole, south-west Western Australia. After at least one year and 1000 hours as a Level 1 ropey, you can go for your Level 2 course and assessment. A Level 2 ropey learns more complicated rescues, rigging, and hauling techniques. The same requirements apply before you can sit your Level 3, a minimum of one year and 1000 hours. Trainers and assessors put you through your paces when you go for your Level 3 assessment. It’s a heady thing to be ultimately responsible for the safety of your crew, and culpable if anyone goes wrong. Going for my Level 3 was one of the toughest weeks ever, and passing the assessment was a massive achievement for me. Polishing the hand-rails with these handsome fellas, Phid and Coops. The hierarchy of levels in rope access is a great system as it teaches you to look out not only for yourself but for others. It’s vital to communicate and work well as a team, because if something goes wrong it is likely to be seriously bad. It’d be hard to justify lazy or shoddy work practices after an accident. It became really clear when I was a team leader how much people rely on each other for mental and technical preparation when they’re on the job. Working at height, we also have to be hyper aware of the hazard of dropped objects to people outside of our work crew — the potential for serious injury to a person resulting from an item we drop is high. We're diligent about putting a lanyard on everything and ensuring barricades to areas below our work space. The safety mindset is reinforced diligently on good worksites. It can seem like overkill to outsiders, but it's an important core principle to industrial companies. As cheesy as some of the slogans sound, after a while it’s hard to shake the safety thinking that gets drilled into you: ‘It’s always the right time to do the right thing’. Even cheesier is 'safety never sleeps!'. Word to the wise - avoid saying to people that in earnest! This set-up was just for the glamour water shot. Just kidding — here we’re taking down rigging gear that had been set up in an elaborate engineering plan to lay new pipe on the ocean floor, connecting the platform to a new field. "Morning lads! And lady..." - I heard that every day for two weeks straight on the job at one mine site. I like to laugh, but after a while that sort of casual sexism just isn't funny. The construction and resources industries have traditionally been male-dominated and often I was one of a few or the only woman on a job. A workmate mentioned to me that he noticed a difference for the better when there were women in the workplace, and I certainly had more fun when there were other women around. I was explaining rope access recently to someone who remarked that the job sounded ‘man-heavy’. I'd never heard that expression and it made me laugh, but it’s important to consider why some industries are so women-light. I know the challenges of being the odd one out, but the positives of the experience outweighed the negatives. There are huge opportunities to be had and it's important we encourage people in their endeavours, especially as there is so much value in having diverse workplaces. Orange is the new black. Side bonus was not having to buy clothes for work. We can do better in encouraging young girls and women to approach working in any industry with a full belief in their own capabilities. Embrace mechanical advantage and learn to ask for help when needed, and anyone can work a physically demanding job. This brings me round to my approach to my new career in user experience design. Perhaps you’re thinking, ‘Emer, the link seems tenuous’, and yes, I see your point. I gained invaluable experience in understanding the complexities of large-scale industrial design and their operations. I also learnt a tonne about was people, teamwork, thinking on my feet, strategy, communication, and the importance of having a problem-solving rather than a defeatist attitude. While I miss being able to wear trendy overalls to work, I don’t miss the dirt. Thanks for reading! If you’d like to check out my other endeavours, I’m working on projects that you can see in the portfolio on my website — www.emerboothman.com. More dirt. It's probably not good for my skin. People come to the field of UX design from a whole range of occupations, bringing with them a huge variety of skills. It's one of the aspects of the industry that's so exciting to me, as the scope for improvement in design in all aspects of our lives is also wide. From what I've seen so far, the common factor that ties these designers together is an empathetic soul. Good design stems from thinking about how people will use it, so a wide variety of backgrounds in designers should lead to better and more inclusive design overall. I take a practical and pragmatic approach to design philosophy. I've noticed similarities between the way systems are structured in my experience as a town planner and then as an industrial climber, and within Maslow's hierarchy of needs. These hierarchies are a great way to frame the problems we try to solve in any profession. In each, the lower level is generally the first need encountered by people and involves more effort to meet. When I worked as a town planner, I was conscious of the impact that design choices had on the environment and human interaction in a physical sense. For instance, people are willing to walk between 800m to 1000m to a train station, but will only walk roughly 400m to a bus stop. Planners must consider such human behaviour and motivation when designing neighbourhoods and transit systems. If not, people tend to find their own shortcuts, which can be a fine thing, but it may also mean the design has failed people. The differences in thoughtful vs thoughtless (or short-sighted, to be kinder) planning are clear when you compare the ease of getting around in a city with a great public transit system to one that is planned for cars and not people. Working as a rigger and climber on mine sites and oil rigs, a company's commitment to safety culture made a big difference to every-day attitudes and to ensuring workers all went home safely. It made a big difference to a crew's behaviour when their company cared about safety, because doing the right thing by everyone else became habit. PPE - personal protective equipment is safety equipment for cyclists. The pyramids illustrate that if we don't meet the base level, we can't meet higher needs. That doesn't make the higher echelons less legitimate or unworthy of consideration, but their solutions are likely to be less effective if the others aren't met first. As when people say 'first world problems'. Sure, it depends on what someone is complaining about, but sometimes a person's problem is a real problem. It's up to us as their friend to really listen and maybe help them find a solution, or to say 'Snap out of it!' The safety, design and needs hierarchies are just three I'm fairly familiar with now. While the consequences might be different in different fields (heavy machinery vs losing customers from a shoddy sign up process), all the problems are valid. Each framework informs my approach to user experience design.